Recently, I had the honor of being a guest blogger where I talked about Putting On the New Self. You can read it here https://hispurposeinme.org/2017/04/13/putting-on-the-new-self/. Furthermore, we are given instructions as to what to put to death and what we are to put on. There is quite a list as to what we are to put to death. This would include things such as sexual immorality, impurity, passion, evil desire and covetousness. Thus we are put away any bad habits or objects that stir these up. Ask the Holy Spirit to reveal to us where any of these might exist in our hearts. Yet, the Apostle Paul goes on to say that we must put away all anger, wrath, malice slander and obscene talk. We are not to lie to one another either. I know that this is not easy. But we can do all things through Christ who strengthens us. He does not say that you can’t be angry but what he is saying is not to stay angry thus you will be free of anger. Malice is the desire to inflict, injury, harm or suffering to another. Slander is defamation thus wanting to ruin someone’s reputation. These are heart issues of selfish person. As a new creations with a hidden life, we are to put on compassionate hearts, kindness, humility, meekness and patience. As well, we are to bear with one another and forgive each other. Therefore we are to turn our hearts toward others. I heard it said that humility is not thinking less of yourself but thinking of yourself less and others more. I like to think of meekness as one that is not easily provoked to anger. Compassion is a strong desire to helps those who are suffering. And above all we are to put on love. The key to putting all of this on is letting the peace of Christ rule in our hearts and letting the word of Christ dwell richly in us. He has the power to transform our hearts therefore we are enabled to follow these instructions. How are you at following instructions? 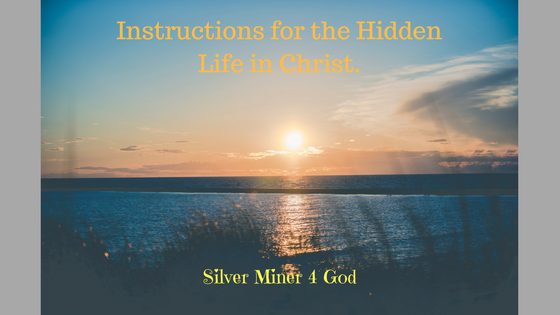 Hidden Life in Christ. What are we instructed to do? What does it mean to have abiding faith? This past weekend I attended the Lutheran Women’s Missionary League, Texas District Convention in Lubbock. Our keynote speaker, Cindy Steinbeck of Steinbeck Vineyards & Winery, spoke to us about abiding faith. Our theme for the convention was based on John 15:5, I am the vine, you are the branches. Cindy gave us the definition for the word abide and talked to us about the significance of the root of the grapevine. Abiding faith comes from being rooted in Jesus. He is like the root of the grapevine which is drought and disease resistance. Jesus is holy and therefore we are holy because we are grafted into Jesus. The root nourishes the grapevine and so Jesus provides nourishment for your spirit. Hence, God is the vine-dresser. He directs the growth of the vine thus seeing what needs to be pruned. Together both God and Jesus helps us to grow. Yet, we are to abide (continue in relationship) with Him. Apart from Jesus we can do nothing just as a branch when cut away will die. When God wants me to grow, He makes me uncomfortable. In order for me to bear fruit (such as gentleness, kindness, patience, and self-control), I must be abiding in Him. I am to stay rooted in Jesus through His word and prayer. He alone can provide me the strength I need, the wisdom and discernment in the various positions that He has placed me. I interjected Cindy Steinbeck’s definitions into the following passage where the word abide is found. “I am the true vine, and my Father is the vinedresser. 2 Every branch in me that does not bear fruit He takes away, and every branch that does bear fruit He prunes, that it may bear more fruit. 3 Already you are clean because of the word that I have spoken to you. 4 Dwell in me, and I in you. As the branch cannot bear fruit by itself, unless it remains in the vine, neither can you, unless you continue in relationship with me. 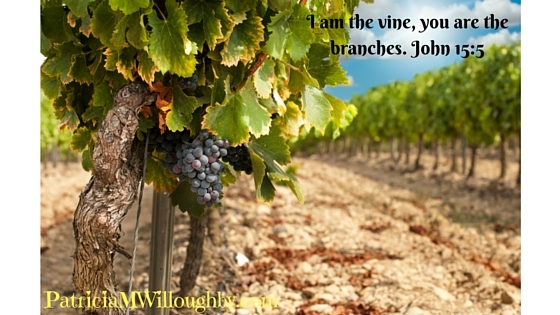 5 I am the vine; you are the branches. Whoever remains in me and I in him, it is he that bears much fruit, for apart from me you can do nothing. 6 If anyone does not remain in relationship with me, he is thrown away like a branch and withers; and the branches are gathered, thrown into the fire, and burned. 7 If you dwell in me, and my words dwell in you, ask whatever you wish, and it will be done for you. 8 By this my Father is glorified, that you bear much fruit and so prove to be my disciples. 9 As the Father has loved me, so have I loved you. Stay in my love. 10 If you keep my commandments, you will reside in my love, just as I have kept my Father’s commandments and continued in His love. My question for you. Where or in whom are you abiding? Abiding faith is placed in Jesus. There are a number of beautiful word pictures in the Bible. Today, let’s look at those address spiritual adornment. I have found a couple in Proverbs and one in Isaiah that I will explore first. First, the beginning of Proverbs 1 it talks about wisdom, instruction and teaching. I find that heeding the instruction of my father and the teaching of my mother is described as a graceful garland for my head and adornment for my neck (Proverbs 1:8-9). Therefore, I asked the question, what is the significance here? This word picture points to the fact that our lives are to reflect whose instruction and teaching we follow. Thus, it will be as plain as a necklace or garland worn on our heads. Second, Proverbs goes on in chapter 3 verse 21-22 to say that I should not lose sight of wisdom and discretion for they are life for my soul and again, an adornment for my neck. Hence, I would hope that my life reflects the beauty of God’s wisdom much like the beauty of wearing a set of pearls as seen above. Third, in Isaiah 61:10, I find another word picture that is inspiring. Likewise, God has graced us with these through His Son, Jesus. God calls us beloved and chosen. He dresses us with the righteousness of Christ. He loves us with an everlasting love. Last but not least, there is one more that I have found in the New Testament in 1 Peter 3 verses 3-4. Here, I am to adorn myself with the hidden person of the heart with imperishable beauty of a gentle and quiet spirit. This is precious in God’s sight. This is also in stark contrast to what the world would have me to adorn myself. How do you adorn yourself, according to His Word or to the way of the world? How do you adorn yourself? As the world or as God would have you? Mining Proverbs 2:3-5, 10-11 for Understanding. You can find the word understanding in several places in God’s Word. Have you ever taken the time to contemplate its meaning? I want to explore it in the above passage. Let us first define it. It is the ability to understand something; comprehension. 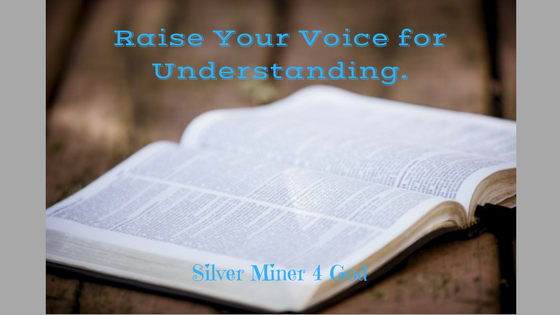 We find the word in verse 3, ‘…and raise your voice for understanding.’ Thus, we are to raise our voices to God for comprehension of His word. Verse 4 tells us ‘to seek it like silver and search for it as for hidden treasures.’ Seek is defined as an attempt to find. Therefore, we are to make every effort to seek insight and understanding as if we were searching for silver and hidden treasures. This is not a passive action but active and sought after with purpose and intent on finding it. God gives wisdom to those who ask without finding fault. He wants us to cry out to Him for understanding. Furthermore, there is a reason we call out for it. This is given in verses 10-11. “For wisdom will come into your heart, and knowledge will be pleasant for your soul; discretion will watch over you, understanding will guard you,” ESV. This being said seeking insight, understanding, and wisdom from God is good. It benefits the heart and soul but one has to mine it as one would for silver and hidden treasure. But this will take time and determination. And I know it is well worth it. Mine His Word for Yourself. I pray that your mining God’s Word, as if for silver, will be rewarding. Each person’s walk with Gods is different and unique. Hence, I am just sharing with you what I have learned because I want to give God the glory for what He is doing in my life. Mining God’s Word is always rewarding.